LAHORE: (Wednesday, August 1, 2018): Punjab University Department of Information Management's Professor Dr Kanwal Amin has been appointed Director External Linkages to promote relations with other academic, research organizations and industry. Prof. Kanwal Ameen has served as Chairperson from May 2009 to May 2018 of Department of Information Management and Chair of Doctoral Program Coordination C ommittee of the Punjab University for 4 years. She has served on prestigious international conferences' organising committees, has chaired their sessions, and has presented papers. 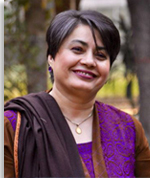 Prof. Kanwal has got a number of international and national awards/scholarships such as Research Fellowship as Professor, University of Tsukuba, Japan (2013), Fulbright Post-Doc, University of Missouri, Columbia (2009-2010) Fulbright Pre-Doc, University of Texas, Austin, Higher Education Commission of Pakistan's Best Teacher Award and Best Paper Award in Social Sciences, Pakistan Library Association's Life Time Achievements Award and Asian Library Leaders “Award for Professional Excellence – 2013”, India. She has authored more than 140 publications which include scholarly journal articles, conference proceedings, books and book chapters. She is the Chief-Editor of Pakistan Journal of Information Management & Libraries and on editorial advisory boards of international journals.